"The role of psychoactive drugs has been airbrushed out of the conventional picture of Western civilization. The academics who have created this drug-free Greco-Roman world have found their nemesis in Dr. Hillman's The Chemical Muse. With clarity and directness, the author gives us back a lost chapter of our Classical heritage and by doing so restores our understanding of this past." "In addition to demonstrating the importance of medicinal botanicals and chemicals in alleviating the sufferings of humanity in the ancient Greco-Roman world, Dr. Hillman unveils the role that many of them played as recreational drugs, nor for the lunatic fringes of society, but as sources of knowledge and religious sacraments by the leading artists, thinkers, and politicians, central to the very formation of what we admire and enshrine as the Classical tradition. 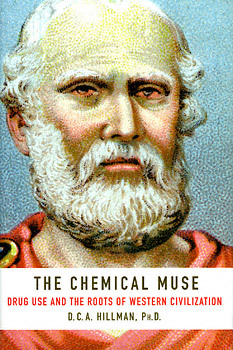 The Chemical Muse inspired democracy itself and the greatest minds of antiquity."